This should have been close to infanticide but the heatwave vintage 2003s are strangely approachable. After a good double decant the wine showed itself to have the classic linear Latour style, densely packed with blackberry, gravel and a touch of grilled meat. The tannins were in abundance yet ripe and seductive and the finish lasted well over a minute, revealing layers of spice and smoke. Administrator Frederic Engerer says the 2003 is “the sexiest Latour ever made.” He also described it as “the 1990 without any brettanomyces.” I loved this wine from the barrel and was fortunate enough to be able to purchase a small quantity, enjoying every bottle I have had. A profound example of Chateau Latour, the full-bodied, opulent 2003 is already performing well at age eleven, which is somewhat atypical. The pH is a relatively high 3.8, which also indicates low acidity. The wine is very ripe, but not over-ripe, offers great freshness, and lots of creme de cassis and camphor as well as hints of blackberries and chocolate. Dense, thick and unctuously textured, this staggering Latour is undeniably the most sumptuous, opulent wine made here since the 1982 or 1961. Drink it over the next two decades.Drink: 2014 - 2034. Tasted at Bordeaux Index's "10-Year On" tasting in London. 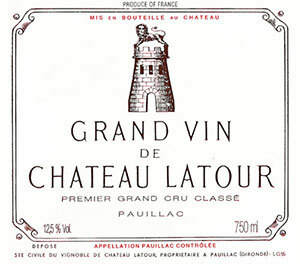 The Chateau Latour 2003 has to be one of the best wines of the vintage. There is a sense of grandeur on the nose, one of those rare Latour vintages that is so sensual and extraordinarily pure. There are subtle graphite notes, cedar and brambly black fruit that are supremely well defined. The palate is medium-bodied with very fine tannins, perfectly judged acidity and a beautifully composed, focused finish. It has lost its voluptuousness in recent years and is being "honed down" by the passing years into a wine that whilst not matching the 1959, is certainly inspired by it. Tasted March 2013.